The light-haired punk rockers of Hórmónar come together for an impromptu jam session in their garage, a cosy space crowded by instruments, speakers and records galore. A week ago this would’ve been a regular rehearsal for punk rock band Hórmónar, but after having won the Icelandic Music Experiments, they’ve been put in the same category as some of Iceland’s most successful bands.Overwhelmed with happiness and still in a state of shock after their sudden recognition, they plug in their instruments and turn up the volume. The Iceland Music Experiments has been known to be a great platform for Icelandic bands. Undeniably so, when looking at previous winners like Of Monsters and Men, Samaris and Mammút. “The story goes like this: we walked into my garage, saw we had something special and won the Icelandic music experiments. I love that story.” Örn, the drummer, states. The newly renowned Hórmónar sit down and discuss the post-Icelandic Music Experiments life. Urður: We’re all very musical and used to performing. However, we only just started playing our instruments when we started the band so we actually do play from our hearts. We liked our sound and enjoyed practicing. Örn suggested we’d participate in Músíktilraunir so we signed up in a rush, right before the deadline. We filled out the application and then there was no turning back. Örn: And since we are all novices at the instruments we play, something exciting happens when we start jamming. Katrín: Yeah, we aren’t inhibited by techniques. We are also best friends, so collaborating is not a problem. Everything runs smoothly because we are organized, honest and, well, loud. Brynhildur: We are a bit manic. We sometimes end up practicing the same song over and over again for hours. Our lyrics are based on our own experiences and feelings, which makes our music a very personal form of expression. Therefore, getting such recognition for it is an honour. Whose idea was the name? Urður: Hórmónar started off as a bad joke that stuck to us. We started talking about hormones and Katrín said we were more like Whoremones. (Everyone laughs) It was either that or the Blonde Anxiety Patients. Örn: And apparently band names are the main reason for band drama so I decided to keep my mouth shut. 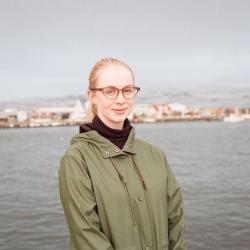 Brynhildur Karlsdóttir: Singer, lyricist and assistant director at Gaflaraleikhúsið. Örn Gauti Jóhannsson: Drummer and aspiring actor, studying acting a FG. Urður Bergsdóttir: Bass player and background singer, dresser at Borgarleikhúsið and model. Also studying acting at FG. Katrín Guðbjartsdóttir: Guitar player, mother and works at a kindergarten. Hjalti Torfason: Saxophone player who studies adventure guiding at Keilir. You’re a busy group, where do you find the time to practice? Örn: We make the time. We all have busy schedules but for the competition, we put everything aside. We practiced for weeks and Katrín, Urður and Brynhildur all got sick. We took the classic “show must go on” stand and competed. Örn: We should use the chance now and thank my parents for letting us rehearse in the garage and not killing us. Katrín: And mom for babysitting! What is your dream venue in which to perform? Örn: Nasa holds all our best memories! I remember being sixteen and somehow sneaking into Airwaves and dancing at Nasa was always the best. Performing there would be a dream. Hórmónar has promised a concert in the nearest future, including Airwaves 2016. Follow them here to make sure not to miss it.